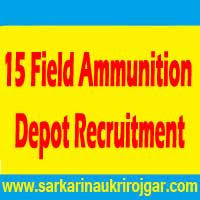 15 Field Ammunition Depot Recruitment 2015 – 49 LDC, Fireman & Other Posts:- 15 Field Ammunition Depot has published latest notification for filling up 49 posts of LDC, Fireman, Trades Mate & EBR. Desirous & eligible candidates can apply in prescribed application format within 21 days from the date of advertisement. Age Limit: Between 18 to 25 years as on the closing date of receipt of applications. 1. LDC: 12th pass or equivalent. English typing @ 35 W.P.M on Computer OR Hindi Typing @ 30 W.P.M on computer. 2. Trades Mate: Matriculation (10th pass or equivalent ). 3. Fireman: Matriculation (10th pass or equivalent ). 4. EBR: Matriculation (10th pass or equivalent) with proficiency in EBR’s trade Job. Desirable : One year experience in the trade. Date of Advertisement: 19/09/2015 to 25/09/2015. Last Date : Within 21 days from the date of advertisement. Last Date for Remote Areas Candidates: Within 28 days from the date of advertisement. Application Procedure: Eligible candidates may send their application in the prescribed format along with all relevant documents by registered post within 21 days from the date of advertisement. Subscribe our free job alert mail for 15 Field Ammunition Depot Recruitment 2015.